A big "Oops!" on my part. I scheduled a blog post and then forgot to make the card. As my granddaughter would say, "My bad!" Today is the launch of a new product and I just can't wait to share it! 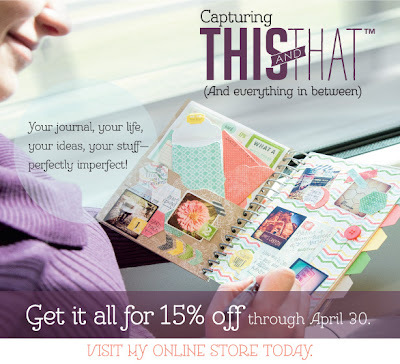 I have fallen in love with "This And That" and I think you will too! Take a look! 133350 Epic Day This and That Bundle $32.08 15% 0ff retail value! Click here to shop the This and That line. This and That is great when you use all the products together, but each product is great on its own too! The Designer Series Paper will appeal to scrapbookers and crafters alike-and everyone will love that awesome stamp. Plus, the other embellishments are so much fun. I am especially excited about the rotary stamp, which includes not only the date, but an assortment of great sayings like "This happened on" and "Best Day Ever." There are 12 choices in all! But wait, there is more excitement!! As a special promotion, all orders placed today and tomorrow will be eligible for a drawing for the hostess benefits This is a Mystery Hostess online event! If you order online, please be sure to enter hostess code YQV66932. Once you add your first item to your shopping bag the hostess code must be entered just below the Special Offers section and it should say Barbara Dykhouse as the hostess. Your items will be shipped directly to your house!